Have you ever been walking with a dog and thought, ‘If I was wearing rollerskates right now I wouldn’t have to do a single thing’? Or, ‘I wonder how much pressure a hand bone can endure before it cracks? Or, ‘how much force it takes to pull an arm from its socket’? If you’ve ever walked a ‘puller’ you’ll know exactly what I mean. Dogs are strong, even little ones, they are fast (especially given that they have the benefit of four walking appendages to our two) and they love being out and about smelling, scenting and expending all that pent up energy they’ve acquired throughout the day. So is it any wonder that, when they are released from the boundaries of the family home, they burst forth with jubilant excitement dragging along anyone silly enough to try to constrain them? Thus, following on in our series, today I will be investigating ideas to transition our dogs from maniac pullers into calm, well-mannered walking companions. I can’t help but feel like a broken record but time and time again I read that consistency is the key to all behavioural modifications. And it is no different with curtailing the pull. Making sure our dogs knows who’s the leader and what they expect of their pack is crucial. This is where training and the principles of repetition and patience come into play. For those of us that already have full to breaking point schedules this strategy is perhaps an unwelcome burden, but thankfully there are options. 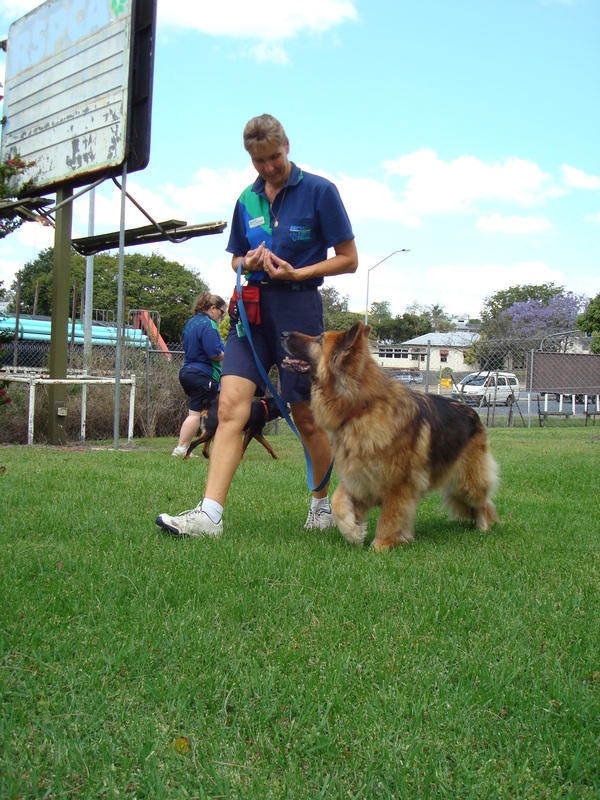 Firstly, there are dog behavior specialists who are available to come and assist you as you train your dog. There are also obedience schools, which again provide specialist facilitators that can assist you with training. And of course dog walkers. Having said that, what your dog learns with others will still need to be replicated by you when you venture together outdoors. For those of you who’d prefer you teach your dogs its tricks here are some tips. Firstly, before going for a walk, play a game or two with them to tire them out. Most of the time we take our dogs for walks just after they’ve had a nap or been at home all day storing up their energy so is it any wonder they explode when they sense its playtime? Thus a game of fetch, Frisbee or tug-of-war will release the pressure valve. It’s also important that our dogs are calm leading up to the walk so that their peaceful, relaxed persona transitions into a composed pre-walk and walk experience. Thus, if your dog is hyped up after its pre-walk game, take a moment to quiet things down. Perhaps make them have a drink and then sit whilst applying the restraint, rewarding them with a little treat when they are calm. Rewards are another way of reinforcing desirable behavior. It is recommended that when teaching our dogs to walk nicely we must ensure training sessions are short, often and fun, with the added incentive of treats, preferably special ones that they don’t often receive. Finally, if your dog is a free spirit that enjoys smelling the roses and will pull you to all and sundry for a sniff or wee the experts suggest you get a move on and quicken your pace. Apparently our dogs are more interested in us if we move quickly and also less able to catch a whiff of something if they are coursing past. Walking our dogs is a great way to bond with them and enjoy their jovial personalities. Teaching them some manners may seem like a task but it is certainly worth the effort and ensures taking them out is more of a treat for both of you then a nightmare and it certainly decreases the embarrassment and pain. ASPCA, Teaching Your Dog Not to Pull on a Leash, http://www.aspca.org/pet-care/virtual-pet-behaviorist/dog-behavior/teaching-your-dog-not-pull-leash, 11th September 2013.